Copycat version of Dairy Queen's popular Buster Bars. Line the bottom of 9x13-inch dish with crushed Oreos (I like to use a tall foil pan, so I can just toss it when done). Spread softened ice cream over Oreos. Place the dish in the freezer and allow time for the ice cream to freeze again (1 to 2 hours). Spread fudge sauce on top of the vanilla ice cream (if it's too thick, put it in the microwave for just about 10 seconds to soften a bit). Sprinkle peanuts on top of the fudge, then the Cool Whip over the peanuts. Freeze again. 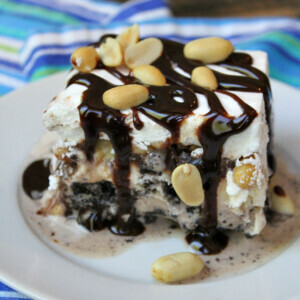 Cut into squares, and serve with additional hot fudge and peanuts- if desired. *Blue Bell Ice Cream actually still comes in 1/2 gallon size. Most of the other brands have made theirs smaller! *If you're using homemade whipped cream in place of Cool Whip, just whip up about 1 cup to 1 1/4 cups of heavy whipping cream with a teaspoon of powdered sugar. *If you do choose to use a foil pan, choose one that comes with a lid! *Keep leftovers covered in the freezer.